Sometimes you may need to assign a swimlane executor during the execution of a business process. If there must be only one executor, you can use a dynamic swimlane, defined by a script. 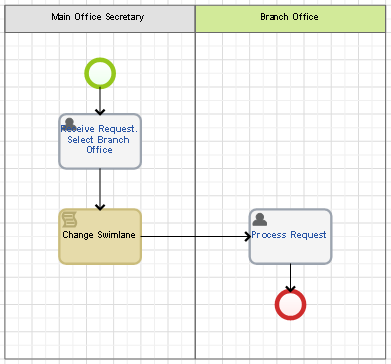 However, in some cases, you need a task in a swimlane to be received by a group of users with the First Response mechanism (the first user to start the execution of the task becomes the executor in the swimlane), and at the same time, the group is defined during the business process execution. For this, you can use a script executed upon changing the swimlane settings. For example, assume there is a Request Processing process. Requests are received in the main office, and the processing takes place in branch offices. 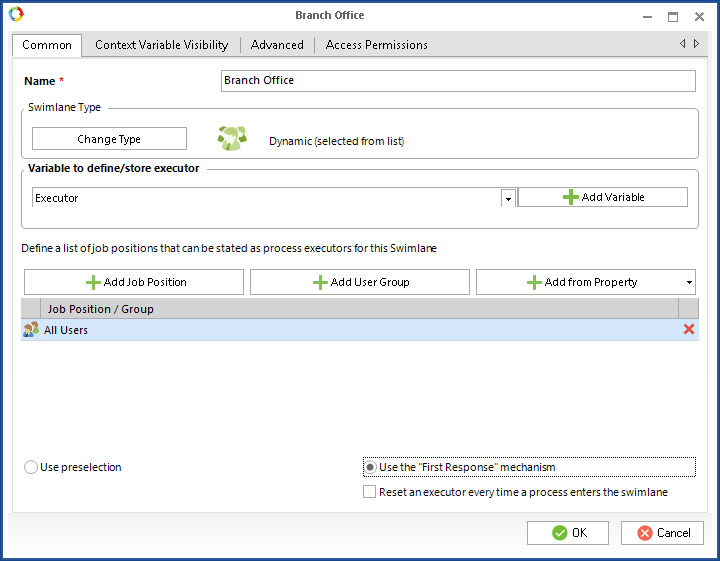 A branch office is selected when receiving a request. Then the task to process the request must be sent to the employees of the selected branch office so that one of them executed the task. User group - User Group type. Variable to define/store executor - the Executor context variable.